We encourage everyone to walk, ride a bike, use public transit, or carpool to the march. Sign up here to carpool to the event (whether you want to ride, offer a ride, or are flexible). Be sure to include your contact information. If you are offering rides, you might want to use the notes section to say what your route is or if you are willing to stop on the way to the event. E.g. 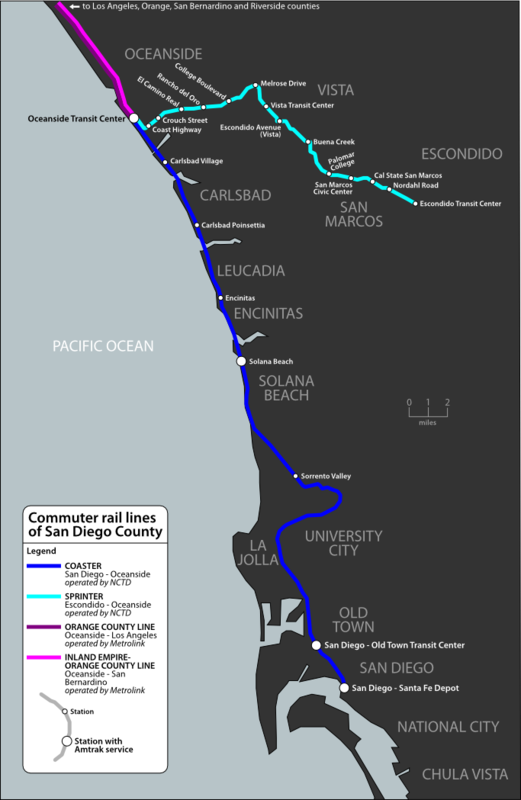 : “Coming from Carlsbad via the I-5, could make a stop or two in Encinitas and Solana Beach, or someplace on the way”. We will arrive at Santa Fe Station at 12:10 pm. Returning coasters are available at 3:18, 7:10 or 9:05pm. Meet at Qualcomm to take the trolley (green line) together to City Hall. Tons of parking. We’ll meet on the 11:38 am trolley. Nancy Yuen will wait on the west bound platform from 11:22 and will have signs to distribute to folks bound for the People’s Climate March. Contact her to let her know you can come at 619.218.0684 or nancyuen at yahoo.com. Meet at Lemon Grove Station to take the trolley (orange line) together to Civic Center. Angela Deegan (tall woman with gray hair carrying a sign for the march) will wait on the Westbound platform at from 11am. Trolley departs at 11:20, arrives at Civic Center at 11:51. Please note there is limited free parking (22 spots) at Lemon Grove Station. Bus Route 235 Southbound. (Just one of many buses you can take!) Meet Nicole Peill-Moelter (Petite woman with an SD350 tee-shirt and a sign for the march) at Sabre Springs Transit Station (Has free parking) at 10:40am. Bus departs at 10:55. Many thanks to Nancy for carefully researching 17 different public transit routes to The People’s Climate March San Diego. There’s lots of street parking at City Hall (meters are free on Sundays). You can also park at Horton Plaza – first three hours free with complimentary validation, after that you have to pay. The County Waterfront park (location of the rally) also has parking available underground for a minimum charge of $10 (they sometimes charge up to $20). The entrance to this parking garage is at the south side of the County Administration Center on Ash Street. Grab your bike and join us for one of several bike rides that will feed into the People’s Climate March San Diego. Questions? Ideas? Want to help fill in missing info on this page?